In keeping with the construction-site retro-fit trend (from New York to San Francisco) the Chicago Architecture Club just launched a contest for proposals to do something–anything!–with the stalled Chicago Spire’s giant foundation site. 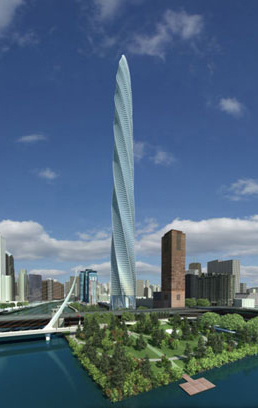 Calatrava’s 2,000-foot-tall tower would be the country’s tallest. 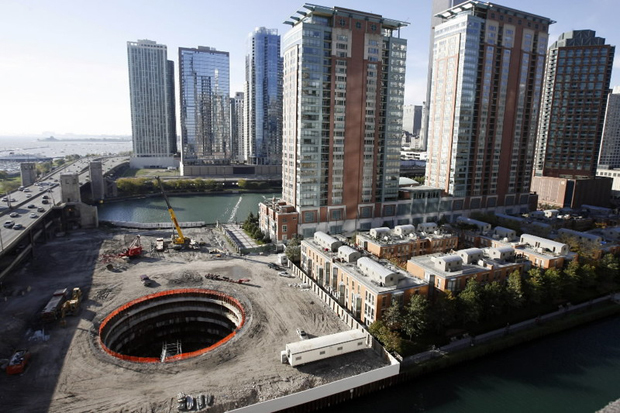 Instead, it’s a 76-feet-deep, 110-feet-wide hole on Lake Shore Drive. Construction was stalled over a year ago when the tower’s financing was thrown into disarray. The developers, Shelbourne Development Group and Garrett Kelleher, supposedly defaulted on a loan and Bank of America sued them for $4.9 million. Shelbourne sued the bank right back as the firm continues to look for other funding sources (the latest attempt was asking local unions to pony up, claiming the project would pay for itself in construction jobs). So on gapes the giant maw, a silent reminder to boom-and-bust. This isn’t something you can pull a blue plastic tarp over and forget about. So what do you do with it? Architecture critic Blair Kamin asked Chicago Tribune readers that question last October and got some hilarious responses, from a giant Dunkin’ Donuts to a receptacle for the city’s controversial Children’s Museum expansion. Now the Architecture Club is joining in with “Mine the Gap” (har har). Like San Francisco’s Bay Line, the point isn’t really to build anything, but instead to take an optimistic look at the architectural bloopers that pepper our cities. We can’t ignore them anymore, and even though we might not be able to fix them now, thinking about how we could–and, in a sense, how outrageous the fixes would be–might keep us from making the same mistakes.